Garum is one of those ancient foods that everyone seems to have heard of. 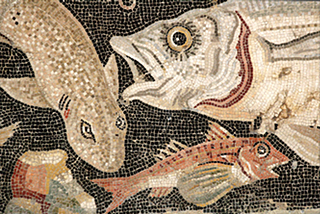 It is usually described as “fermented fish guts,” or something equally unappealing, and people often call it the Roman ketchup, because they used it so liberally on so many things. Fermented fish guts is indeed accurate, though calculated to distance ourselves from it. And garum is just one form of fermented fish; there’s also liquamen, muria. allec and haimation. All this I learned from Laura Kelley, author of The Silk Road Gourmet. Unlike most of the people who opine on garum, and who offer recipes for quick garum, she painstakingly created the real deal. She is also convinced that it isn’t really Roman in origin. We only think of it that way because history is written by the victors not the vanquished. And then there’s the whole question of the Asian fish sauces, Vietnamese nước mắm and the rest of them. Independent discovery, or copied from the Romans? Laura gives a full blow-by-blow on her website. Copying her is probably the only way to produce something that approximates genuine garum. She also mentioned colatura, a fish sauce still made in Italy. I haven’t tried it, although it is available, at least in the US, by mail order. Photo of the garum vats in Baelo Claudia by Janet Mendel. Very interesting about garum! I’ve always wondered if anyone had tried making it. Thanks to Laura Kelley for the insights. And, thanks for crediting my photo of garum vats at Baelo Claudio, Tarifa, Spain. The is way too much mystery behind the garum Vail. Perhaps there is way too much mystery behind most culinary things these days? We humans all have the facility for hooking up to the currents that are there in the atmosphere. The Garum lay sleeping and we just woke it up. Please let me know if you want a sample of the garum we are fermenting.